After some hours at Liseberg we all got hungry and went to my favourite noodle bar in Göteborg, Mi Noodlebar on Västra Hamngatan. When I go to Mi, I tend to always order the same dish: Salmon with Teriyaki sauce and wooked rice for 79 SEK. The dish is really nice, and even though the Ramen dishes are very nice as well no one beats the great Salmon dish. The sauce is exellent and the wooked rice with eggs is delicous. We usually don’t eat any starters, we just go for a main course and a dessert (always deep fried banana with bean paste and ice cream), but this time our friend ordered really nice dumplings before the main course (salmon for all) and we all skipped dessert as we had already eaten waffles. The salmon was great as always, and we all enjoyed our meal. I really recommend this noodlebar as the food is exellent, the prices are very reasonable and the staff is friendly. Sorry for the bad photo quality, the photos were taken with my cell phone. Oh no… The Cookie Monster will skip wonderful unhealthy cookes for broccoli and healthy vegetables… Today I read an article in Swedish newspaper Aftonbladet about poor Cookie Monster that has to eat less cookies due to the growing problems with obesity among children. Apparently 16 % of all American childen between 6 and 19 years are suffering from obesity. The Cookie Monster will teach the children watching Sesame Street that too many cookies make it difficult to learn new things and that cookies only is a “sometime food”. I think that it’s a very good initiative as children is getting fatter and fatter and need to form healthy habits at young years, but I’m still worried about the Cookie Monster… Will he really manage without cookies and will he now change his name to Broccoli Monster? 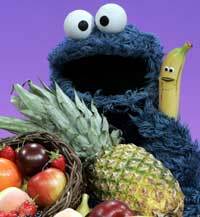 And what about his wonderful cookie song, “C is for cookie”? Entries (RSS) and Comments (RSS). 23 queries. 0.311 seconds.